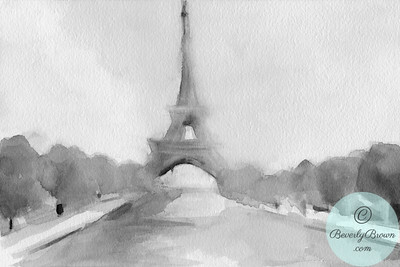 A monochromatic watercolor painting of Paris, France. A classic Parisian scene of the Eiffel Tower in the Champs de Mars park. © Beverly Brown. All Rights Reserved. 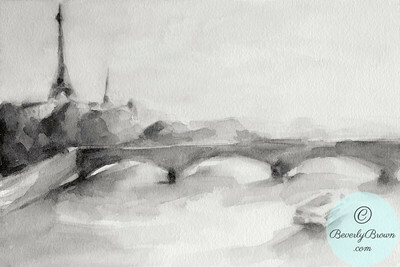 A monochromatic watercolor painting of Paris, France. A classic Parisian scene of a bridge on the River Seine with a bateaux-mouches and the Eiffel Tower in the background. © Beverly Brown. All Rights Reserved. An impressionistic view of the Pont de Change (bridge) on the River Seine in Paris, France. 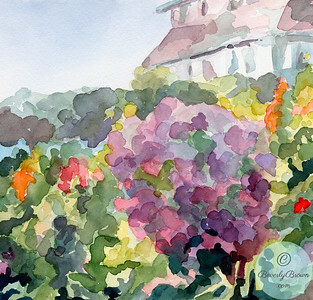 Technique: watercolor on paper. © Beverly Brown. All Rights Reserved. 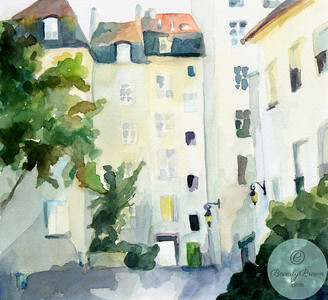 Watercolor painting of the Village St. Paul in the Marais neighborhood of Paris, France. © Beverly Brown. All Rights Reserved. 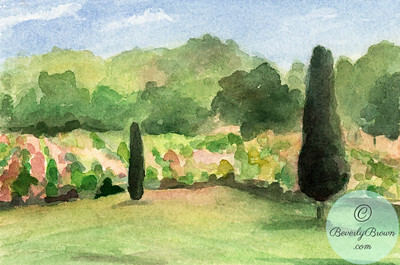 A row of topiary in the formal gardens of the Parc St. Cloud, designed by Andre le Notre, just outside of Paris, France. 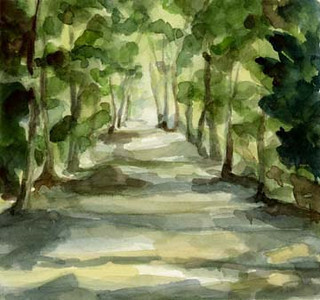 Technique: watercolor on paper. © Beverly Brown. All Rights Reserved. A purple flowering shrub in the gardens of the home of French impressionist painter, Claude Monet, in Giverny, France. 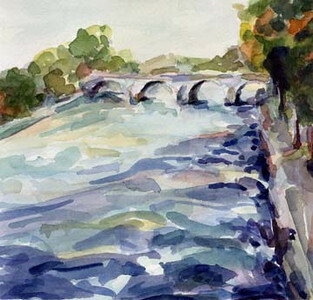 Technique: watercolor on paper. © Beverly Brown. All Rights Reserved. 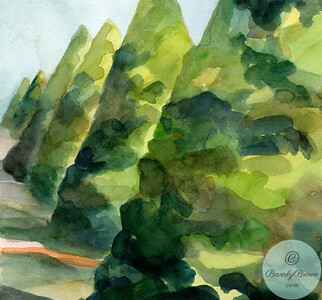 Watecolor painting of trees in the Parc de Saint Cloud, a formal garden just outside of Paris, France. © Beverly Brown. All Rights Reserved. 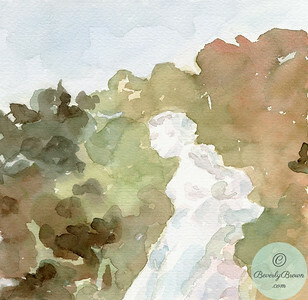 Watercolor illustration of a vineyard in the Provence region of France. © Beverly Brown. All Rights Reserved. A footpath in the Parc de Saint Cloud, a formal garden just outside of Paris, France. Watercolor on paper. © Beverly Brown. All Rights Reserved. 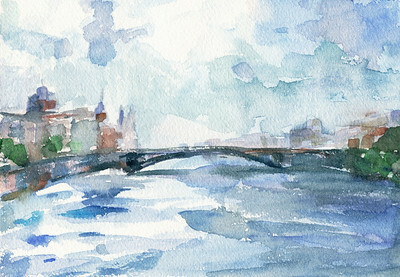 Watercolor painting of the Pont Marie in Paris, France. © Beverly Brown. All Rights Reserved. 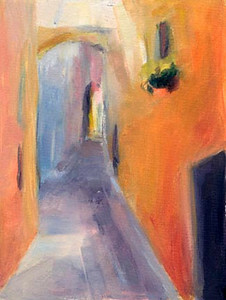 Street in the "Old Town" section of Menton, on the French Riviera. Oil on paper. © Beverly Brown. All Rights Reserved. 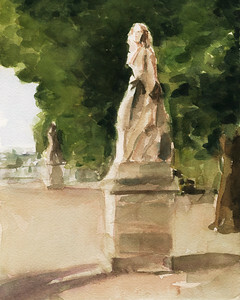 A statue of a woman in the Parc de St. Cloud, a famous garden designed by Andre le Notre, just outside of Paris, France. Technique: watercolor on paper. © Beverly Brown. All Rights Reserved. A footpath surrounded by flowers in the gardens of the home of French impressionist painter, Claude Monet, in Giverny, France. 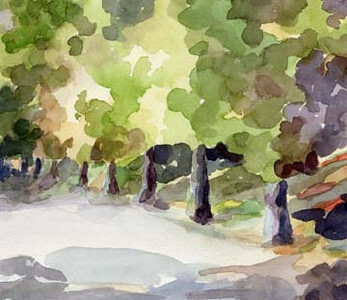 Technique: watercolor on paper. © Beverly Brown. All Rights Reserved. 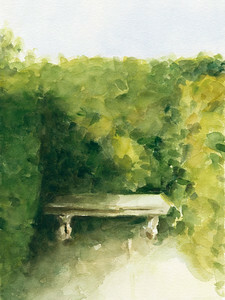 A watercolor illustration of a sun dappled corner of the Parisian Parc de Bagatelle. Copyright Beverly Brown. 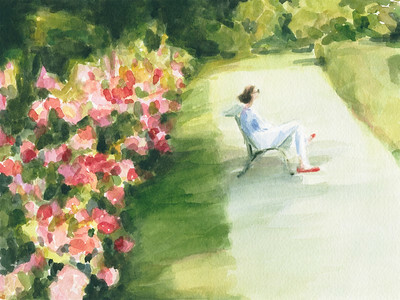 A watercolor illustration of a sunlit afternoon in the Luxembourg Gardens in Paris. Copyright Beverly Brown. 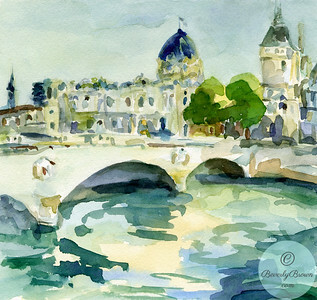 An impressionist style watercolor illustration of Paris France. 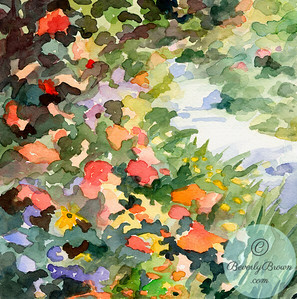 Beverly Brown Artist.